Mary first got involved in agility in 1994 because she thought it "looked fun" and has since trained a variety of dogs of all sizes, breeds and mixes thereof. She began teaching for a local agility club around 20 years ago and now runs her own training school, The Agility Facility, in Salem, Connecticut. Mary's dogs have competed extensively in the Northeast earning the sport's top titles, and have also been semi-finalists at multiple championship events across the country and ranked in the Agility Top Ten national standings. An advocate of strong foundation training for agility and not rushing her dogs, Mary believes that "it is a journey from the time dogs begin their puppy fundamentals until they retire." Mary is a fun, knowledgable, experienced and very approachable instructor. She says she enjoys teaching new teams and loves the diversity of breeds of dogs. She loves seeing teams come together and being able to share in their journeys. For the past few years, Mary has been following the OneMind Dogs methodology and has traveled to Finland twice with her dogs as well as Canada and Florida to train with several OneMind Dog coaches. This training fits right in with the way Mary looks at dog agility training. Mary is ecstatic to join the OneMind Dogs team as a certified Instructor! Holly Burchsted began her training journey with family dog classes and quickly nurtured an interest in behavior analysis and modification. This gives her a unique perspective which helps her troubleshoot when challenges arise in dog training. Just like her dogs, Holly's terrier tenacity loves to jump head-first into a challenge and problem-solve an outcome where everyone wins. Holly's canine family includes 4 terriers and a border collie. She currently competes with her young rat terrier, with her border collie up and coming. Holly has been following the OneMind Dogs training methodology for several years and found that her relationship and understanding of her dogs has greatly improved. She loves traveling to faraway lands for agility training camps, including Finland, Canada, Florida, and Pennsylvania. She has met some truly wonderful people through agility and is most happy when surrounded by her dogs and peers, playing and talking agility. Holly is ecstatic to join the OneMind Dogs team as a certified Instructor! While still an equestrian competitor in college, Lora was bitten by the agility bug after seeing it on tv. She obtained her first JRT, Marron, in 2005 with the intent of training her for agility. A second JRT, Spy, followed soon after Lora began to compete with Marron in 2007. Lora achieved great success with both of them, attending AKC nationals multiple times (Spy was an 8" finalist in 2013), USDAA's Cynosports, achieving MADs in USDAA, and championship titles in both AKC and UKI. 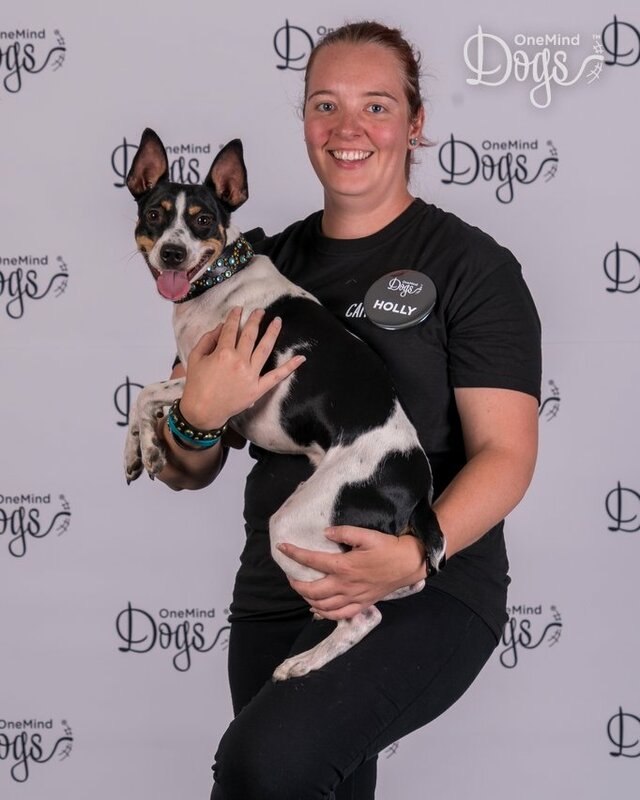 Rat Terrier Kraft joined the pack in 2011 and is following in his sisters' footsteps: attending and making finals at Cynosports in 2014 and 2015, and at the US Open in 2016. The youngest member of the pack is Kraft's nephew Roots who is just starting his agility training. Lora has always loved teaching, giving riding lessons since before she could drive, all the way through college. Since discovering OneMind Dogs training she has learned a new love for the dance between dog and handler on an agility course. Having started in the world of terriers, she has a unique appreciation for all types and sizes of dogs. After a successful sports career as a nationally ranked archer, Diane hung up her bow in 2003 and picked up the sport of dog agility, as a way to encourage confidence and overcome anxieties in a dog she rescued. Diane’s goal was to learn a little, meet some new people, have fun, build trust, and perhaps compete on occasion. Since then, Diane has met those goals and also trained 3 more dogs for agility, earning 20 Championship titles in AKC, USDAA, UKI and NADAC along the way. A student of the sport, Diane is eager to learn various methodologies and their appropriate application. As an archer, she began studying the mindset of winning and is now gaining a reputation as an effective sports results coach, in part, because of her personal philosophy to “Make it happen.” She focuses on building mental strength, confidence and the mindset needed to be successful in sports and life. In 2016, with her sheltie, Cruzer Patterson, Diane won the Westminster Masters Agility Championship. She earned a spot on the 2016 AKC Team USA, 2015 UKI Team USA, and was selected as an alternate for the 2015 AKC European Open Team. As a 3-time Cynosports Finalist, Diane and Cruzer placed 3rd in Grand Prix Finals. She is a two-time AKC Agility Nationals Finalist, as well. Diane’s support system includes Billy, her husband of 32 years, and the Patterson Pack: Boomer (rescue terrier), and 3 shelties: Kazee, Catcher, and Happy (puppy in training).